Pastor Ewan Mwarire. (WATCH Channel 263 video at bottom of this page of Mwarire speaking after his release on bail on Tueday). Prominent Zimbabwean government critic Pastor Evan Mawarire has been released on bail by the High Court in Harare and has claimed that hundreds of people in jail need medical attention. Mawarire was one of more than 1,000 people arrested recently in a government crackdown on protests against dramatic fuel price hikes in Zimbabwe. He has been charged with subversion and faces 20 years in prison if convicted. Mawarire told reporters that President Emmerson Mnangagwa’s government was no better than that of former leader Robert Mugabe. With the country’s flag wrapped around him while he held a Bible, he said: “Once again we have to run and hide. It breaks my heart. “I was locked up with over 300 young men whose limbs were broken after being beaten by soldiers and police. It is a tragedy, it is a shame. 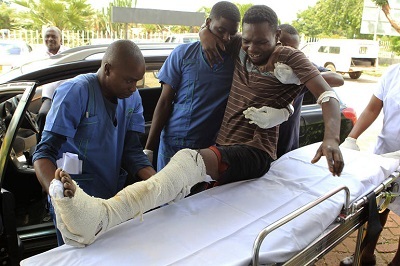 It is unclear if any of the prisoners in the jail on the outskirts of the capital, Harare, have received any medical care. Action by the police and army followed a breakdown in law and order in Harare and Bulawayo two weeks ago which led to some looting and rioting. Twelve people were shot dead by police while many more were assaulted amid the worst violence seen in Zimbabwe in 10 years.